OTTAWA -- An environment professor at Dalhousie University says Canada's push to lead the G7 into a war against plastic garbage would get a whole lot more heft if the federal government started enacting stronger policies at home. Tony Walker says Canada is actually lagging behind many other countries, at least 40 of which have enacted some sort of national policy to curb the use of single-use plastic drink bottles, plates, straws, and grocery bags. In a new article published in the journal Resources, Conservation and Recycling, Walker argues Canada would be sending the right signals if it steps up with a national ban on plastic bags. "I think they could send a message, a very strong message," Walker told The Canadian Press. Several small Canadian municipalities have banned plastic bags and Montreal became the first major city to do so in January. Victoria will follow suit in July. However Walker says it's too ad hoc of an approach and doesn't encourage manufacturers to streamline their products to make for easier recycling. He also notes many attempts at the municipal level to enact bans in Canada and the U.S. have failed, including in Toronto in 2012. Walker says he knows a ban is a heavy handed approach but in our "use once and then discard" mentality, we need to force people to think harder about what happens to their products of convenience. He noted Canada banned the manufacture of microbead plastics already, deeming them to be toxic to human health or the environment, and will ban the sale of shower gels, face scrubs and toothpaste that contain them in June. Given that plastic bags and straws that end up in the ocean have been proven to be toxic for marine life, he wonders why Canada can't use the Canadian Environmental Protection Act to do with plastic bags and bottles what it did with microbeads. 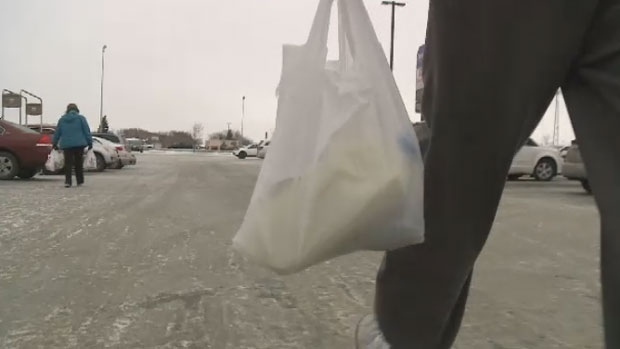 "I don't know the mechanism how (a plastic bag ban) could occur but I hope they're very forward thinking and progressive about this," Walker says. Last week Environment Minister Catherine McKenna was at the World Ocean Summit in Mexico, where she was pushing Canada's desire to see the G7 nations sign a plastics charter, pledging to work towards 100 per cent recyclable, reusable or compostable packaging. In a call with reporters she noted the equivalent of a dump truck full of plastic is dropped into the ocean every minute of every day, and at this rate, there will be more plastic than fish in the ocean by 2050. However she did not cite federal bans on plastic bags as one of the steps the government is currently pursuing. When asked about concrete policies of the government on plastic she talked about helping developing countries finance waste management policies, funding science to make plastic that is easier to compost and public awareness. Canada is already playing catch up to the world to address plastic garbage, including several other G7 nations. The European Union in January launched a strategy to get its member nations to aim for 100 per cent recycling by 2030. In France, all disposable tableware will have to be least 50 per cent compostable by 2020, and 60 per cent by 2025. Great Britain cut its addiction to single-use plastic bags by 85 per cent after implementing a five pence (less than a Canadian dime) charge for getting one in 2015. Italy enacted a ban on non-compostable plastic bags at grocery stores in January, although it got a rough ride from the public as it was executed. China banned plastic bags a decade ago although many reports suggest the ban is not enforced much. Kenya and Rwanda have laws that will see people sentenced to jail time for importing or selling plastic bags. Taiwan announced in February single-use plastics will be entirely banned there by 2030. Scotland is barring the use of plastic straws and plastic-stemmed cotton swabs. It's estimated about three billion plastic bags are used in Canada each year, and anti-plastics advocates note most are used for less than 20 minutes each but take hundreds of years to break down. Walker says when plastic bags or bottles or straws are tossed away, and end up in the dump, the river or the ocean, they will eventually break down into smaller bits from friction, UV light, or salt water. Plastics account for about 85 per cent of the garbage found in the ocean and can often trap marine life, or be mistaken by fish and turtles as food. In 2015, Australian scientists found more than 90 per cent of the sea birds they studied had plastic in their digestive tracts. Walker says at a round table event hosted by McKenna's department last month, academics, environment groups, plastic makers and representatives from the food industry all sat down to talk about what can be done and he thinks the government is getting ready to make some big announcements. This coming week, Stephen Lucas, Canada's deputy environment minister, will be in San Diego at the sixth annual Marine Debris Conference sponsored by the United Nations where he is considered a keynote panellist.